The inspiration for this soup came from a classic Vichyssoise, a potato and leek soup generally enjoyed chilled. During the unbearably hot days at culinary school in New York, my teammates and I had made a cold Vichyssoise as an amuse-bouche for the school's restaurant. It turned out that a shot of cold yet creamy soup was the perfect way to start off a copious meal. Chilled soup would, however, be difficult to want to make at this time of year, so I tweaked the recipe to make it desirable for much cooler days. And what better way to serve it than in little espresso cups? Montreal is a cold and bitter city come winter, but also a city where people - who are used to the wintery temperatures - still go out, eat out and enjoy life. Any Montrealer's wardrobe includes an extra pair of legwarmers under your jeans, socks up to your knees and fleece wherever you can fit it. The upside is that once you beat the first couple of steps out of the door, your body, although oddly at first - think frozen eyelids, and steamy cold breath - gets used to the cold and resets what normal warmth is. All to say that a bowl of steamy soup is really a great way to welcome the cold months to come. On a less formal note, I am off to Venice in a couple weeks. Oliver and I were thinking about a small getaway and since were are spending the holidays in France with my family, Venice seemed like the perfect place to go to. I am sure you food lovers and travel lovers can relate to this: when I start booking a vacation, sure I look at the great sights, museums, architecture I want to be sure not to miss, but let's face it, I want to know what kind of food I'm going to be able to sample. Traveling through food is one of the greatest way to really experience the culture of the place you are in, the customs, the traditions and the aura of a place. I've done quite a bit of research and it seems quite unanimous that Venice is not the Italian city where the food is the best. I hear that finding more remote restaurants is the way to go to avoid touristy places with touristy prices. Any advice from you food lovers out there would be more than welcome! I promise to bring back a myriad of photos, and hopefully at least a couple recipes too. In a stockpot, add the pancetta on medium heat and cook until some of fat renders (about 3 minutes). Add the onion and stir to coat the fat. Add a drizzle of oil if needed. Cook until the onions are soft and translucent. Add the garlic. Chop the leeks and add to the stockpot. Saute for 2 minutes. Add the diced potatoes and cook for another minute. Season lightly with salt and pepper. Add the chicken stock. The liquid should just cover the potatoes and leeks. Add water to cover if there isn't enough stock to do so. Add the bay leaves. Bring to a boil. Cover and reduce to a simmer. Simmer for 30 minutes. Taste, and adjust seasoning with salt and pepper. Remove the bay leaves and blend with an immersion blender until the soup is smooth. Add a touch of water if the soup is too thick for your taste. Strain the soup to remove any lumps and strands of leek. Serve warm with crumbled blue cheese and garnish with chives. Enjoy! I am sure the blue cheese brings this soup to a whole new level. Great presentation too! The combination of all three flavors sounds heavenly. Your photos are terrific too! GREAT soup! I love it! I love potato and leek soup. My version doesn't include the pancetta nor blue cheese - but they are both wonderfully delicious ideas. We're definitely having soup weather here and I can't wait to try this. Venice is a place with a few really hot spots visited by people who come for the day. So the touristy places are right by those hotspots. Walk away from them, just a few hundred metres, and you'll find good places to eat. Especially, you should go to the neighbourhood bars for lunch, you'll have interesting things. And if you go to the fish market by the Rialto, there are good places to eat there, too. And, actually, Venetian cooking is under-regarded. Read Francesco da Mosto's book, Francesco's Kitchen, which is a love letter to the cuisine of his city. And Tessa Kiros has just published a new book about Venetian food, which I bought yesterday, but have not yet started to read. Joanna: Thank you for the kind advice. I will be sure to check out those books before my trip, and let you know how it goes! I love bleu cheese, this looks delicious! Your photos are always so lovely as well. Great new twist for the humble potato and leek soup. Whoa, this looks deeeelicious and beautiful..love your food styling and photos!! Have fun in Italy, looking forward to pictures! complete and utter awesomeness. 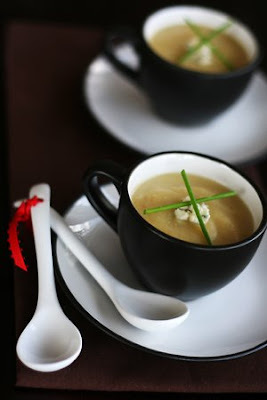 I love potato and leek soup, and the addition of the blue cheese must give it a great kick. Awesome presentation with lovely ingredients. I love soups in winter, warming nourishing and usually make my own. This one looks little thick and my kids like thick one too. I would give it a try.